How cool! My kids would LOVE these! I’m bookmarking this…I’ll have to make it for my daughter’s bday coming up in August. I can’t wait! Post them on your blog if you make them! I’d love to see how yours turn out. And don’t forget the sprinkles! Well you should, Andrea. You inspired them! When Big Sis and I saw them on your blog, we knew we had to try them. They are a masterpiece of cupcake artistry. Thanks for sharing them and starting a new tradition in our family. We’re just happy to spread the love. Cupcake love, that is. OK, I have made an 8 layer rainbow cake, which was cool and all, except for the fact that it took for-evah to do with only 2 cake pans. No I am wondering why the idea of making cupcakes never crossed my mind. Sometimes I need a good whack to catch on. My oldest asked if I could make enough layer cakes to serve 50 (!!!) for his summer b-day treat at school. He’s SO getting cupcakes. I’m totally going to try your Big Sis’ cake recipe, because I have yet to find one that wasn’t too dry. 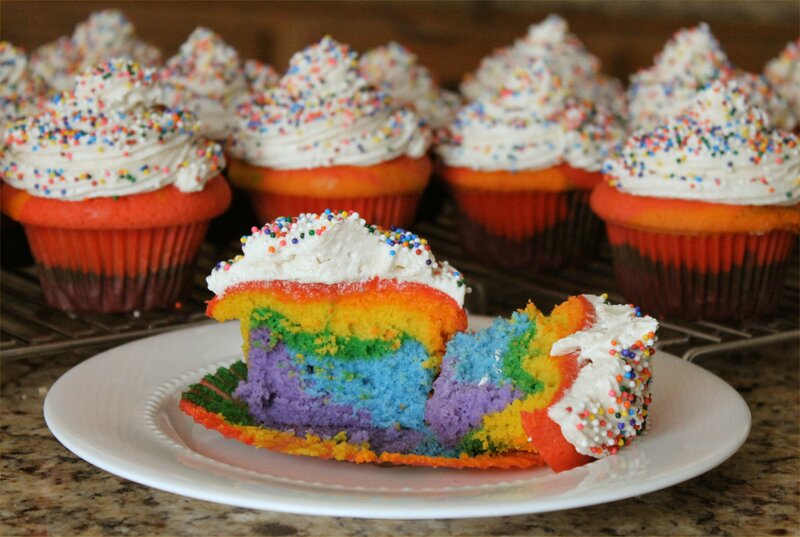 You know, Kirsten…I’ve seen recipes for those 8 layer rainbow cakes and they really knocked my socks off. Then I realized how much work and time they would take to create. The cupcakes are MUCH easier, and just as pretty. Hope you like Big Sis’s cake batter. The key to a homemade cake, in my opinion, is to watch it closely and take it out of the oven as soon as it tests done with a toothpick. Overbaking is the kiss of death. You have to try that frosting, too. It’s incredible. We used the “good stuff” vanilla – my little bottle of pure vanilla paste. Oh, baby!! And while it would be fun to see you host a Baking with NanaBread week, you’ll have to call it what it really is….Baking with NanaBread’s Family. Mom & Sis did all the real work. I just took the photos and wrote it up. I have a recipe for a frosting that is almost identical to the one that you used. My family has been using it forever. LOVE it! We call it “Sander’s Buttercream” because it is supposedly the one that the Sander’s Ice Cream Shoppe in Detroit used on their cakes back in the day. Although I suspect it is the Sander’s recipe about as much as the “Nieman Marcus cookie” recipe that floats around email is actually from NM. Good stuff, either way. Ha! That brings back memories of the old Neiman Marcus cookie urban myth about someone being charged $1,000 (or was it $100) when they asked for the recipe. Classic! Is your Sander’s Buttercream on your blog yet? Me thinks I must go a-searchin’ for it! I love the “tried & true” old school recipes. Big Sis’s Sam Houston White Cake came from an old Imperial Sugar recipe booklet from waaaaaayyyy back in the day. Our mom made it for years, and now I have a copy of my very own (and so does anyone else who reads my blog)! Almost too pretty to eat! Almost. I’d be stuffing my face with that pretty cupcake in a heartbeat. That’s how I felt, too. I thought they were too pretty to eat. Then I got over it. And over it again. What a happy looking cupcake! I have got to try this, it look so cheerful and just in time for spring. Thank your sister for me and thanks for sharing. Thank you, Armi! They are cheerful, happy cupcakes…and they’re delicious, too. It’s hard to have a bad day when you have a rainbow cupcake in hand. I hope you like them. 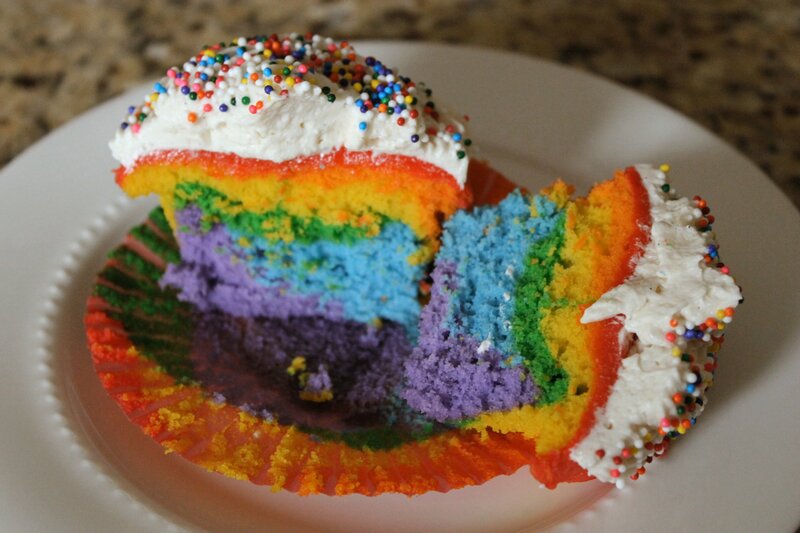 Yummi, yummi, yummi, I have a rainbow in my tummi!!! No, really I do, I ate one just now!!! hehehehe!!! Man, I wish I’d kept a few of those. I’m craving one again since I posted the story this morning. I was trying to be good by sending them all home with you and Mom. Now I’m thinking of making another batch. Bad NanaBread! Bad, bad, bad! I’m going to go eat celery now. And cry. These look just wonderful and so colorful. I love them. Will have to try them for my grandson. Maybe for Easter, too. Thanks for your visit. Come back anytime! Thank you, Southern Lady. I appreciate the visit, as well. It’s always nice to meet another cook who treasures the southern favorites! Ok, you sealed the deal. Clare and I are definitely making these for Easter and putting the coconut bunny on the back shelf(at least for this year). We are going to put nests on top with jelly beans! I can’t wait to see the family’s reaction when they bite into them and …Happy Birthday to your mom, please tell her thank you for having such a beautiful daughter that I’m blessed to call my friend. Thank you, Cindy. That’s very sweet. I’m proud to call you my friend, as well. 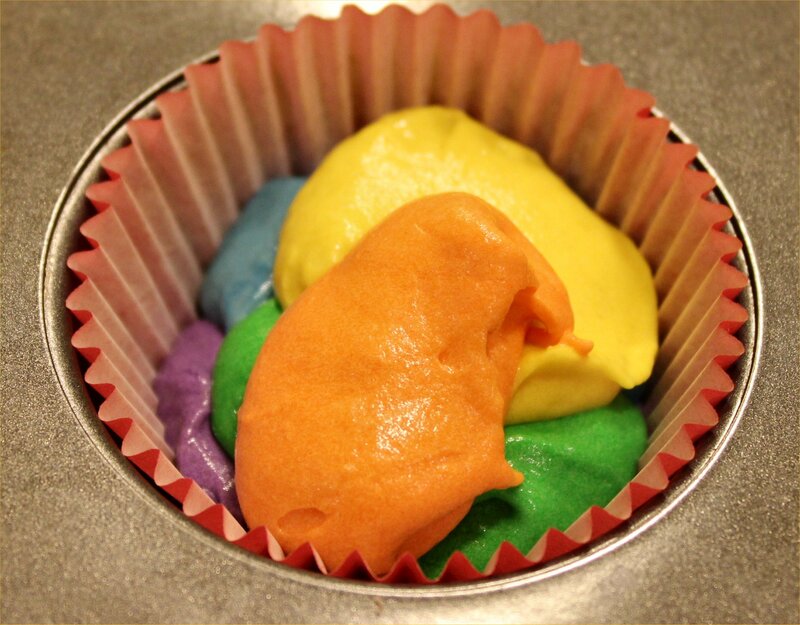 And I can’t wait to see how the rainbow cupcakes come out with nests and jelly beans! You’ll have to save me one. Please. Pretty please. I have to attest, even blindfolded, these cup cakes are awesome. I don’t remember that cake growing up. You must have waited for me to leave the house even back then. I am not a fan of icing but I could eat a bowl of this stuff! Sorry, Baby Sis. It’s not that we went behind your back to make the cupcakes. We just crammed all the “action” items in while you were here, which left more time for baking after you left. And yes, I am Mom’s favorite. Duh. 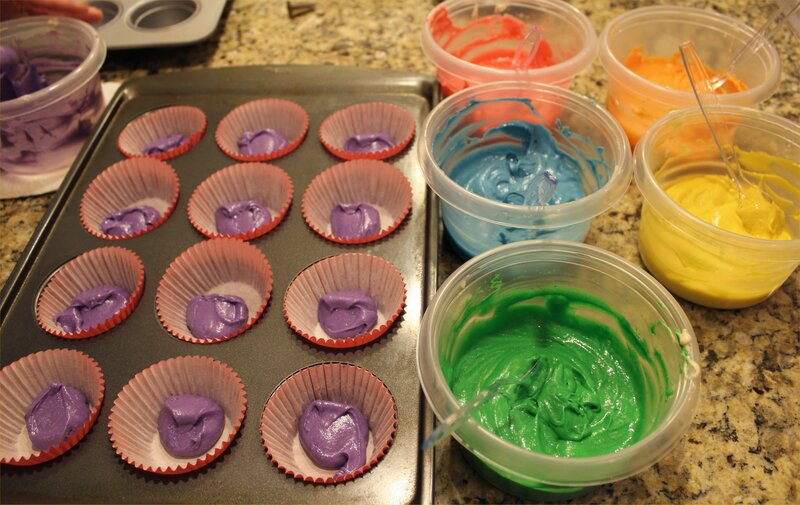 Mom never made the tie-dyed cupcakes when we were little, just the Sam Houston white cake recipe. I remember lots of homemade white cakes with fresh strawberries and whipped cream in the summer. And I detest those greasy shortening-based frostings, but this stuff is different. I could eat this frosting without the cupcakes. All I need is a spatula and a wet-nap. what a cool idea for a cupcake!! Thanks, Mitzi. I think they’re the most gorgeous, colorful cupcakes ever, and we owe it all to Andrea at the “Can You Stay for Dinner” blog. That’s where I first saw them. I think it’s just pure cupcake genius. They’re like little works of art, and each one is a little different. It’s so fun to bite into one and see what it looks like inside. I think I’m going to make them again for the grandkids this Easter. They’re addictive. They do have the potential to be messy, but we contained it pretty well. We used plastic spoons to mix and distribute our colored batters, and threw the spoons straight into the trash. Less clean-up. I do, however, recommend wearing an apron so you don’t ruin your favorite t-shirt or pajamas. I hope you have a great weekend and a blast making these cupcakes! I was thinking disposable spoons AND disposable bowls. :) And I’ll definitely be rocking the apron!! Rock on with your bad self, Sara! And feel free to e-mail me a photo of you, your apron, and your killer cupcakes! Those cupcakes look delicious! I’m going to make them…just like I did the Rocky Road cookies. Rock on! Let me know how they turned out! Don’t forget… you CAN do this the easy way and use a white cakemix. Works just as well. I am making these today with my daughter to take on her 1st day of school! They are beautiful! Thank you so much for sharing!!! If you make the homemade cake recipe my sister used (the one published in this recipe), it will be on the more dense side, as most made-from-scratch cakes are. If you’d like a softer, fluffier cake you can use white cake mix, made to the specifications on the box, and use the food coloring to tint it. It’s really just a matter of personal preference. 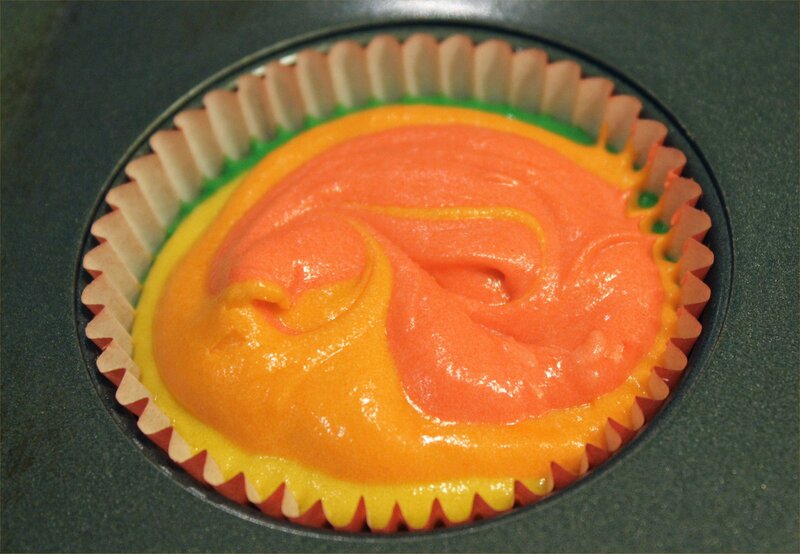 Whichever method you choose, these cupcakes are fun to make and always a hit at parties.